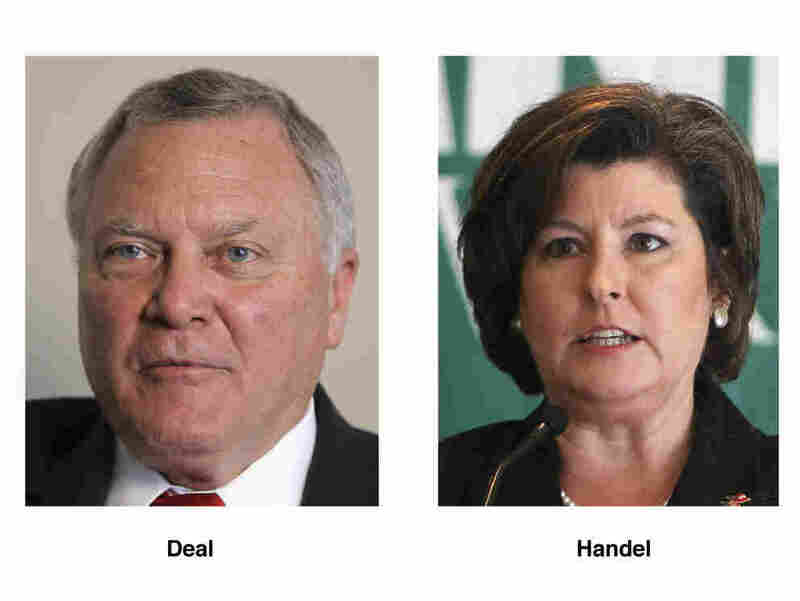 Deal, Handel Locked In Tight Georgia Race For GOP Gov Nod : The Two-Way Nathan Deal and Karen Handel were locked in a tight race for Georgia Republican gubernatorial nod. Maybe Nathan Deal should have spent more time this week campaigning in the Atlanta area. The race for the Republican nomination is, as former President Bill Clinton was fond of saying, as tight as a tick, with former congressman Deal leading former Secretary of State Karen Handel by less than 4,000 votes wit 99 percent of votes counted. Deal, who was supported by former House Speaker Newt Gingrich, had a pretty good margin earlier in the evening. But his margin eroded steadily during the night as vote counts from Fulton County where Atlanta and started rolling in. Handel was polling significantly behind Deal until late in the race when Sarah Palin visited Georgia to give Handel her seal of approval. Her endorsement and campaigning with Handel gave Handel important momentum. As Deal campaigned in less swank areas of Georgia on Monday, Handel campaigned with Palin in the tony Atlanta suburb of Buckhead. Deal took a swipe at both, according to a story in the Atlanta Journal-Constitution. On Monday, Deal's eyes were on Middle and South Georgia, and he touted the fact that he was there, not at "a four-star hotel in Buckhead."